I’ve been a glasses wearer to look at a computer and TV screens since my early teens. In recent years, my laptop has rarely left my lap, so I wear my glasses pretty much 24/7. Despite this, I barely give them a second thought when planning my makeup; despite being a nearly permanent fixture of my face, it’s like I’ve forgotten they are there. I’ve decided, therefore, to start rethinking my morning makeup routine – certainly for those days when I am out and about at meetings, squinting at computer screens over tables in a café. The top makeup tips I’ve gathered together for spectacle wearers are below – and I will be trying my best to adhere to them every morning. If you are a fellow wearer, I hope they come in equally useful! If you are short-sighted, your eyes will appear smaller through your glasses and you should therefore focus on accentuating them. Use a liquid liner to carefully line your whole upper lash line and pick volumising mascara (it’s worth picking a waterproof formula, which is less likely to flake and gather under the lens of your glasses). Kit: Clarins Instant Liner, £16, and DIOR Backstage DiorShow Blackout Waterproof Spectacular Volume Intense Black Kohl Mascara, £21.90. If you are long-sighted, however, your eyes will be magnified. Keep your makeup simple and your eyeliner totally precise (if you don’t trust yourself to draw a perfect line, forget the liquid eye-liner, as any mistake will be glaringly obvious). Stick to a slick of dark brown, rather than brown mascara, and a kohl liner, which should be smudged to soften the line. Kit: Clarins Wonder Perfect Mascara in Wonder Brown, £16, and Guerlain Eyeliner & Kohl with Sharpener, £14.40. Remember that your brows need to work with the line of your frames, so tweeze, wax, or thread them to subtly follow the shape, and softly define them with a pencil. If you wear glasses with thin frames, thicker brows tend to look better – and vice versa, with thicker frames working better with thinner brows. 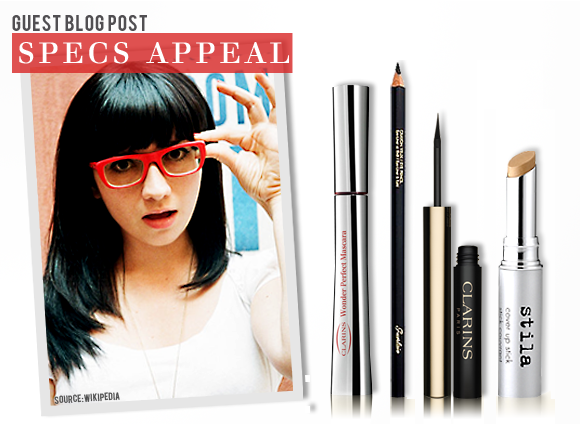 Kit: Mister Mascara Tweezers Japanese Style Tweezers, £8.60, and Clarins Eyebrow Pencil, £12.80. When it comes to eye shadow colours, neutral colours tend to work better for glasses wearers – go too bright and you may end up looking like a clown, whilst very dark makeup will cause your eyes to get lost behind the frames. A palette that contains several neutral colours will allow you to experiment and blend. Kit: Too Faced Natural Eye Kit, £22.50. Keeping your eyes neutral doesn’t mean that your look needs to be boring, so why not focus on your lips with a bold, daring shade? I think a neutral eye looks stunning with a neon pink or pillar-box red pout. This season, the look is also bang on trend. Kit: Dior Addict Lipstick in New Look or Paris, £22.85. Glasses can cause shadows under your eyes, which will make existing dark circles look even darker. Using concealer under your eyes will solve this problem. Pick a yellow-based concealer and make sure you set with pressed powder to remove any shine. Kit: Stila Cover Up Stick, £13, and DIOR Diorskin Forever Pressed Powder, £29.05. This entry was posted on Monday, September 10th, 2012 at 9:00 am and is filed under Guest bloggers, Make-up. You can follow any responses to this entry through the RSS 2.0 feed. You can skip to the end and leave a response. Pinging is currently not allowed. Thanks for a great post – I wear glasses most of the day and never think about these things either!